In more than sixty years, Ed Ruscha has built an oeuvre encompassing conceptual photographs, paintings, drawings, artist’s books, prints, and films that chronicle the development of the American West and of Los Angeles in particular in a singular artistic idiom. 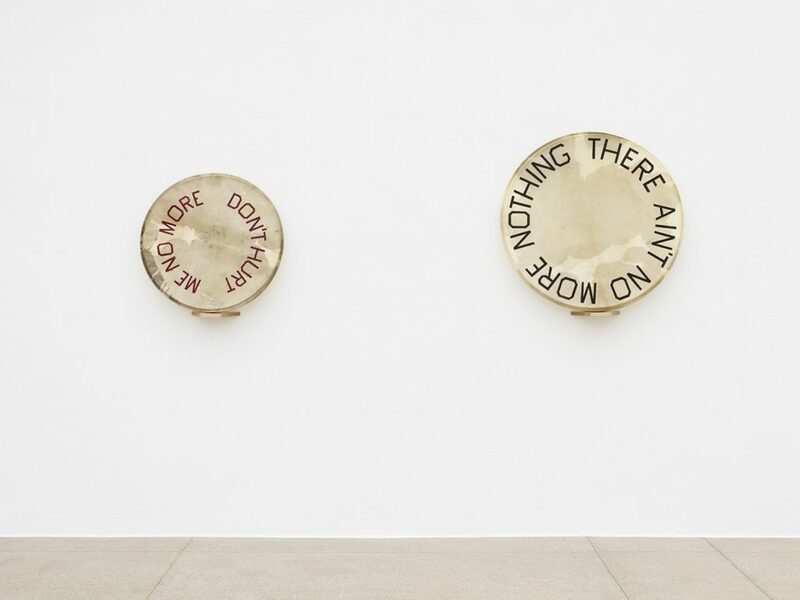 Widely acclaimed as a sober-minded and dispassionate witness and historian, outspoken and enigmatic at once, Ruscha is gifted with a keen sense for linguistic humor and the comedy of everyday life. 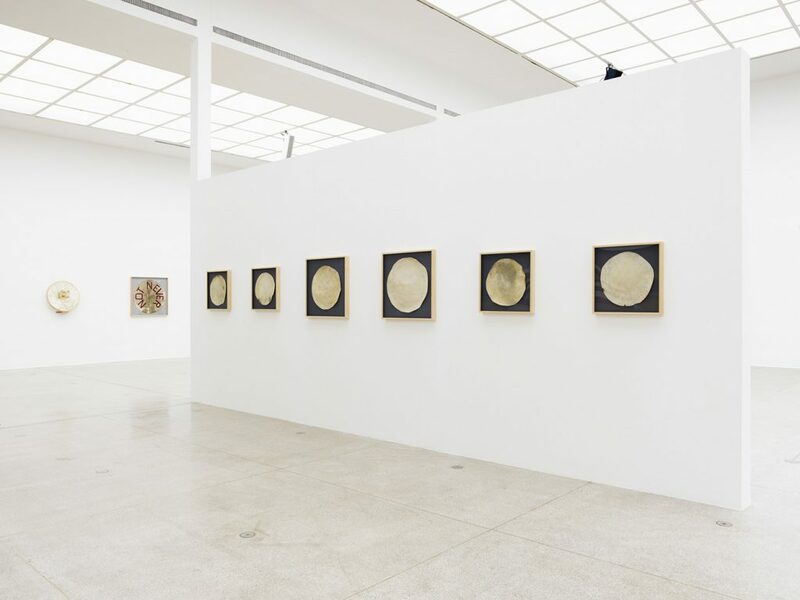 The conception of his most recent exhibition reveals him to be not only an alert observer, but also a master of the well-placed allusion and spellbinding and witty storyteller. 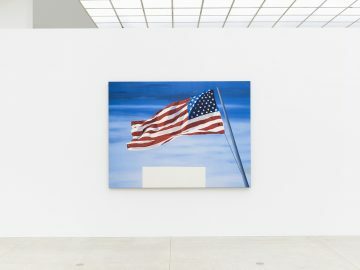 Although most of the works on view are recent, Double Americanisms undertakes an unexpected revision of his own oeuvre. 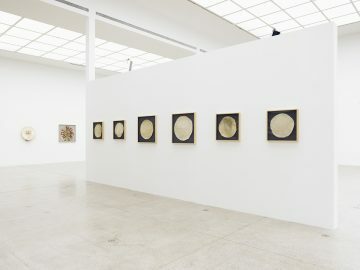 The exhibition showcases altogether fifty-seven works—conceptual digital prints and an extended series of painted language pictures as well as handmade book objects and artist’s books in display cases. Language, in the form of texts or single words, entered Ruscha’s visual art early on; since the 1960s, his paintings have unfolded an increasingly complex interplay between image and text. Making art, he says, is a reaction, almost an automatic reflex, that is often triggered by phrases he overhears, and the selection of works speaks to the vital role that language plays in his art. 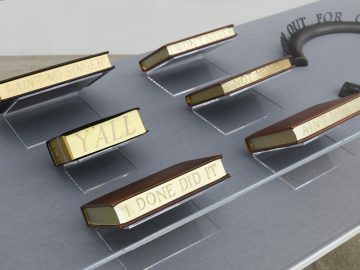 The majority of the works on view are concerned with language in one way or another, often incorporating painted words or sentences, and numerous books are laid out in display cases. Ruscha’s show at the Secession marks the public debut of a new series of linguistic paintings informed by his memories of Oklahoma City, where he spent his teenage years, and the city’s distinctive slang: used parchment drumheads are inscribed with locutions whose shared feature is the use of a double negation—“I Ain’t Telling You No Lie,” for example, and “I Can’t Find My Keys Nowhere.” Expressions like these remind him of the way people around him used to speak, and rather than disavowing them as incorrect English, he picks up on them and transforms them into art. 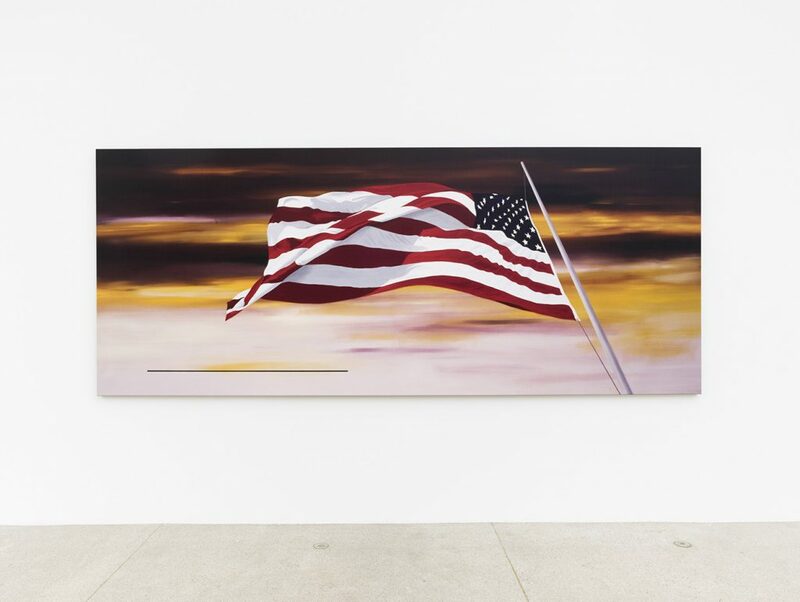 The inexorable passage of time is a recurrent theme in Ruscha’s work, and by reminiscing about his upbringing, he also emphasizes the continuity between his younger self and who he is now—as the artist sees it, he really has not changed much at all. One source of inspiration that Ruscha has drawn on for decades is film. In Los Angeles, the medium is virtually synonymous with Hollywood, whose name, emblazoned on the hills above the city, has become its iconic image. The artist has immortalized the motif in countless works, including a pair of folding screens that occupy a prominent place at the entrance to the gallery. The duplicate digital reproduction, one reading left to right, the other right to left, brings two motifs into play that will recur throughout the exhibition: Ruscha’s reflective revision of his own work and the mirror double, a theme also hinted at in the show’s title. The screens function as a sort of overture or title sequence for the centerpiece of the presentation, a dramatically staged series of six large-format pictures—digital reproductions of three paintings (again, true to side and laterally reversed) showing the star-spangled banner in different conditions that Ruscha created between 1985 and 2017. In the first pair of pictures (after Mother’s Boys, 1987), the American flag proudly waves before a radiant blue sky, but in the second set (after Untitled [American flag on pole], 1985), dark clouds roll in, and in the third (after Our Flag, 2017), a tattered banner before a black backdrop betokens a disastrous outcome. The climax of the progression visualized by the pictures is underscored by the exhibition architecture: the works are mounted on a series of walls of increasing height. Double Americanisms exemplifies Ruscha’s trademark concision and dry humor, responding to the current state of American affairs with the suggestion that history’s arc is long and the present is transient. 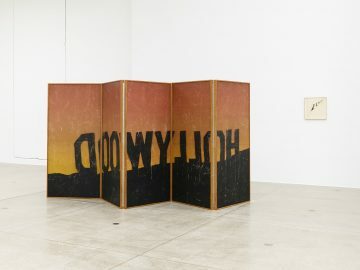 In some respects, the series echoes Course of Empire, an ensemble spotlighting changes in Los Angeles’s urban landscape over the years that was presented in the American pavilion at the Venice Biennale in 2005. Those works in turn harked back to the nineteenth-century British-American landscape painter Thomas Cole’s sequence The Course of Empire, which traced the rise and fall of an exemplary civilization, the implication being that another revolution in the eternal cycle of renewal would follow. 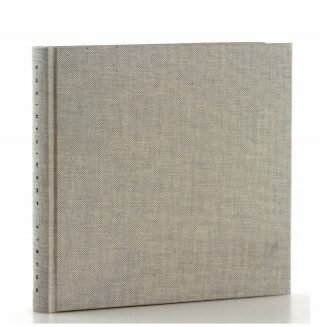 Discretely placed on one of the rear walls, the small work In the Beginning (2011) encapsulates Ruscha’s subtle narrative art—his ability to stir our imagination with allusive understatement—and his conviction that, as Duchamp’s oeuvre taught him, art really is in the eye of the beholder. Like all his works, it leaves plenty of room for interpretation, quoting the first words of the archetypal origin story, the Book of Genesis, to suggest that in a sense the creative process begins when the artist has done his part. 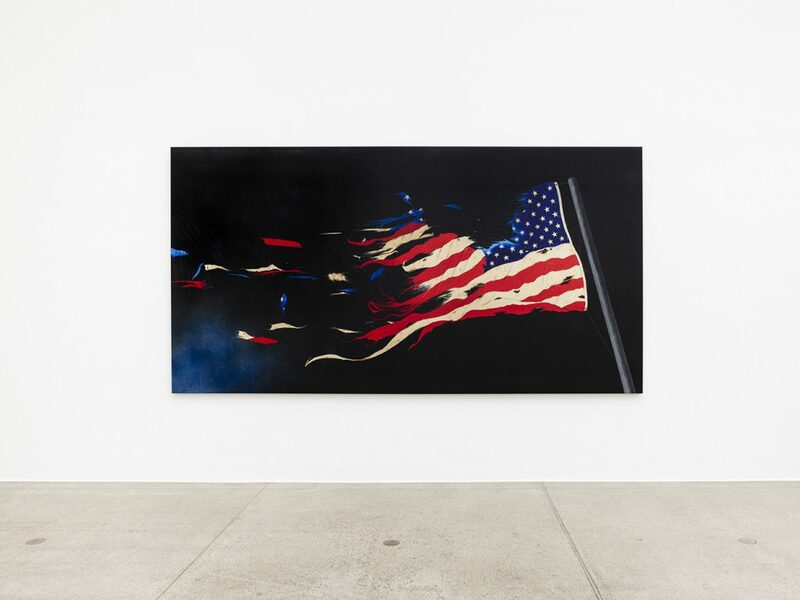 An exhibition that, on closer examination, reads as a tribute to America’s sometimes contradictory pluralism, Double Americanisms rewards the visitor who wanders through the gallery with open eyes. It concludes on a cautiously cheerful note with We the People (2012), a lithograph in which the titular phrase, rendered in an old-fashioned typeface and the foreshortening that is a characteristic feature of Ruscha’s art, recalls the promise of the United States Constitution. Ed Ruscha, born in 1937 in Omaha (Nebraska), lives and works in Los Angeles.